Although patient experiences and stories are unique, many of our patients have benefited greatly from The Reed Procedure ®. We invite you to listen to their success stories, as there is no better way to find out how you might respond to our treatment program than to connect with someone who has been through our migraine treatment process. Listen, consider, and sign up for a free webinar or give us a call. We will evaluate your medical history with you and discuss whether or not you are a candidate for the revolutionary Omega Procedure or Reed Procedure ®. Reed Migraine Centers has treated thousands of patients with the revolutionary pain management procedure called the Reed Procedure ®, also known as the Omega Procedure or 4-Lead Procedure. Reed Migraine Centers has the most experienced procedure physicians in the world. Watch some of Reed Migraine Centers’ patient success stories to learn more. Successful nerve stimulator migraine treatment allows student to return to full activities. Reed Migraine Centers patient Michael describes how Reed Procedure migraine treatment restored his life. Janice’s debilitating migraines are finally controlled by an occipital nerve stimulator. Patient Janice describes how she was able to return to a full life and her family after a successful nerve stimulator migraine treatment. Reed Migraine patient Jennifer reports life restoring successful results after Reed Procedure migraine treatment. 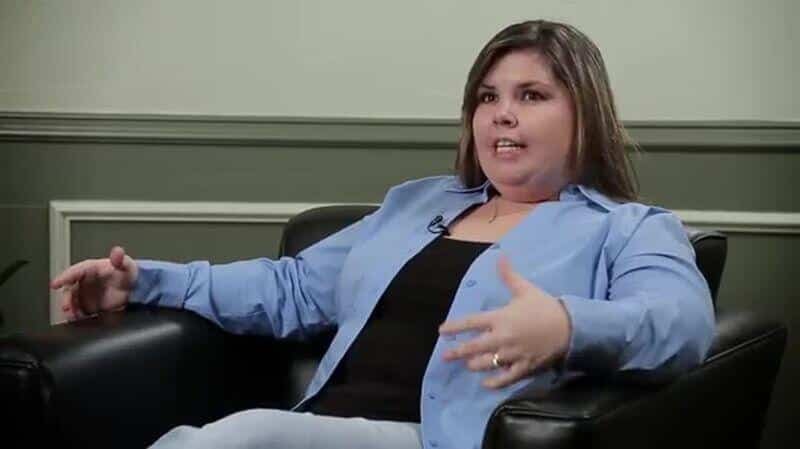 Reed Migraine Centers patient Jessica reports her excitement over finally having her headaches controlled after the Reed Procedure migraine therapy. Reed Migraine Centers patient Kim R reports excellent results following occipital nerve stimulator therapy for her chronic migraines. She was able to return fully to school. A patient reports happiness at having her life and family back after a Reed Procedure neurostimulator for her migraines. A wife and mother relates her joy at resuming a normal life after a successful occipital nerve stimulator migraine therapy. College professor is able to resume teaching after successful occipital nerve stimulator for her chronic migraines. A young student describes her happiness following a successful occipital nerve stimulator for her migraine headaches. A Reed Migraine Centers patient relates her happiness over a successful response to an occipital nerve stimulator implant for her migraine headaches. Reed Migraine Centers patient Rodney describes the successful response to the Reed Procedure as a miracle. “My headaches are gone!”, Kay exclaims after successful occipital nerve stimulator migraine treatment. Reed Migraine patient Kay describes her dramatic response to an occipital nerve stimulator implant for her debilitating migraines. A Reed Migraine Centers college student reports being able to get back to a normal life, including gymnastics, after a successful occipital nerve stimulator for his migraines. “My headaches are gone,” reports Kandice after successful occipital nerve stimulator implant. A patient reports her happiness over having her headaches finally controlled with an occipital nerve stimulator. Patient Karen reports that the occipital nerve stimulator implant dramatically eased her headaches. “I was able to get back to my singing,” a young patient reports following a successful Reed Procedure migraine therapy. Young lady reports her joy at being able to resume a normal life, including her passion, singing, after a positive response to an occipital nerve stimulator. “I could get back to boating,” reports Mike, describing his positive response to an occipital nerve stimulator migraine treatment. Reed Migraine Centers patient Mike reports his joy at being able to resume normal activities, including his boating, following a successful Reed Procedure. “My headaches are finally under control, and I could return to college,” reports a happy patient following a successful Reed Procedure. A young student relates her joy over resuming a normal life, including college, after her headache were finally controlled with a Reed Procedure. Rachel talks about the the Reed Procedure with Dallas Pain Management Specialist Dr. Robert Bulger who inserted her permanent implant. Nicole had a chronic headache since 2007. In 2012, she had Occipital Nerve Stimulation (ONS), and it relieved her pain. Patient Joan happily recounts her first week of being headache free after the Reed Procedure. Reed Migraine Centers patient Joan, a week after her Reed Procedure, describes how her headaches are finally under control. 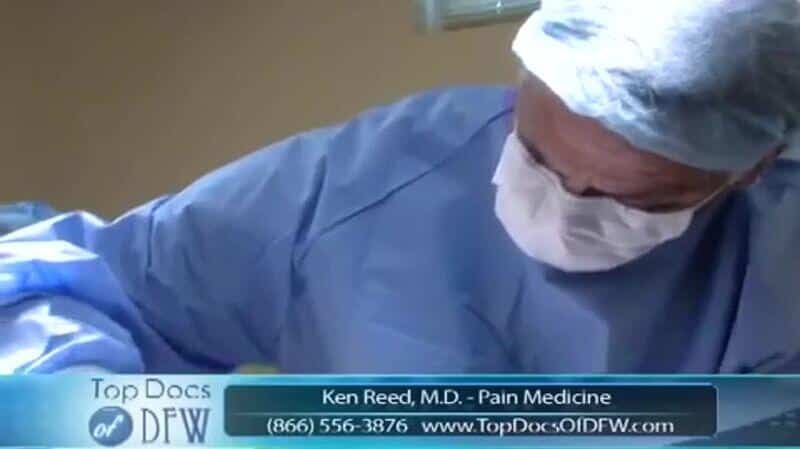 Dr. Ken Reed has been treating patients with the Reed Procedure for more than 25 years. 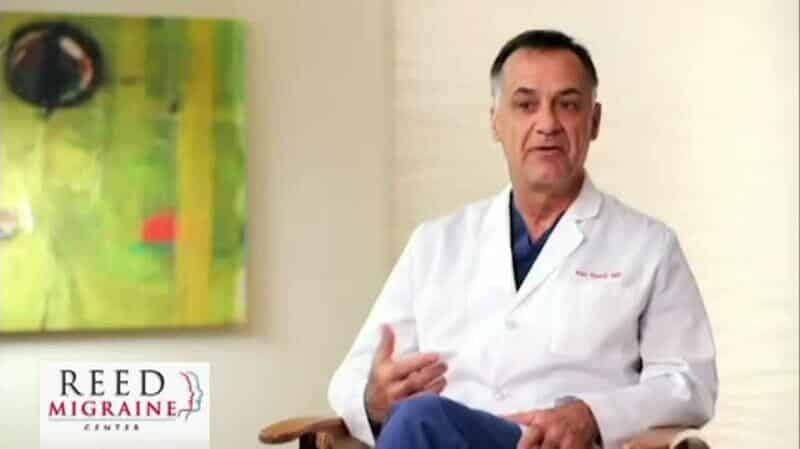 Helping people with severe head pain has been the cornerstone of his life’s work, and over the course of the years, he has gained notoriety not only among patients and peers but also in the news. Fox News features Dr. Ken Reed and patient discussing her successful life-restoring results after an occipital nerve stimulator implant for migraine treatment. Reed Migraine Centers patient Rachel describes how Occipital Nerve Stimulation has finally controlled her migraines. “I feel just great. My headaches are gone,” reports Rachel after her successful Reed Procedure. In hac habitasse platea dictumst. Nunc porta rhoncus elit, vitae volutpat dolor sollicitudin vel. Sed molestie lacinia felis ac pulvinar. Emilie reports, “My migraines are under control,” and describes a return to normal life after successful Reed Procedure. Young high school student finally has her debilitating migraines controlled by an occipital nerve stimulator implant. “My migraines and finally controlled,” states Kim, describing relief after a Reed Procedure nerve stimulator implant. A mother describes her happiness over having her migraines controlled, allowing a return to normal family life after successful Reed Procedure. Jessica’s headaches are finally under control after Reed Procedure. Jessica describes her successful results after a nerve stimulator implant with NBC news. Kim’s headaches are controlled and her life restored after succesfull occipital nerve stimulator implant. Good Morning Texas features Kim’s successful Reed Procedure migraine treatment. Dr. Reed and patient Kim are interviewed. Rachel and Stephanie describe successful life changing results after an occipital nerve stiulator implant for migraines. Good Morning Texas features Dr. Reed along with patiants Rachel and Stepanie, who discuss the life changing results of their Reed Procedure migraine treatments. Newscast featuring Andrew, a young student athlete, describing that the results of the Reed Procedure for migraine even allowed him to return to playing baseball. Kim, a Reed Migraine Centers migraine patient, describes how the Reed Procedure controlled her migraines and allowed her to return to life, including college. Migraine patient Michael: “My headaches were controlled and I could return to life, including referring basketball,” said after the Reed Procedure. Michael, a Reed Migraine Centers migraine patient, describes how an occipital nerve stimulator successfully allowed him to return to a full normal life. Amy, a Reed Migraine Centers migraine patient describes how the Reed Procedure successfully controlled her migraines and restored her to normal activities. Migraine patient Kay describes the migraine control and life changing results of a successful occipital nerve stimulator implant. 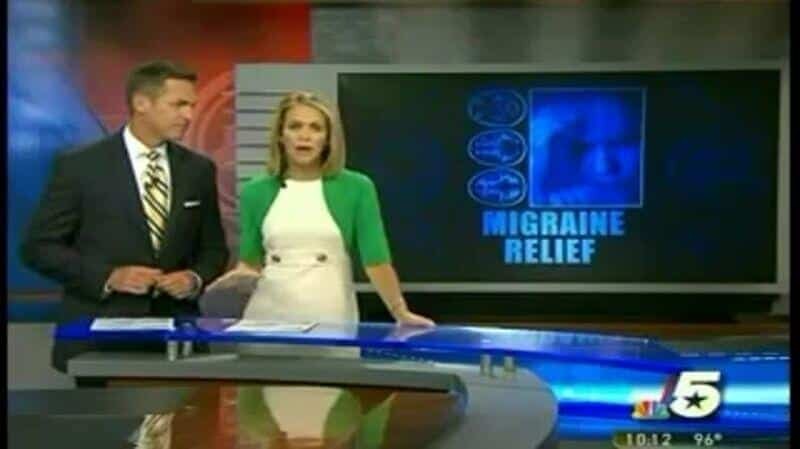 Newscast featuring Dr. Reed and migraine patient Kay, who describes the excellent control of her migraines after an occipital nerve stimulator implant. Migraine patient Kay describes the migraine control and life changing results of a successful occipital nerve stimulator implant – Part 1. Migraine patient Kay describes the migraine control and life changing results of a successful occipital nerve stimulator implant – Part 2. Migraine patient Kay describes the migraine control and life changing results of a successful occipital nerve stimulator implant – Part 3. Nerve stimulation brings relief for migraine headaches. Thirty six million Americans suffer from migraine headaches. CBS News doctor describes success with Peripheral Nerve Stimulation (PNS) and migraine. On Good Morning Texas: Joan’s hemiplegic migraine symptoms fully controlled by the Reed Procedure. Dr. Reed at Reed Migraine Centers answers some basic questions about the Reed Procedure and what to expect before, during, and after treatment. Dr. Reed answers frequently asked questions. Click the link below to see a collection of videos featuring Dr. Reed talking about the Reed Procedure at Reed Migraine Centers. Dr. Reed explains more about the trial stimulator, the permanent stimulator, and what can be expected during the whole migraine treatment process at Reed Migraine Centers. What Makes Reed Migraine Centers So Unique & Special for Nerve Stimulation for Migraine? Reed Migraine Centers has world’s most experienced occipital nerve stimulator implanters. 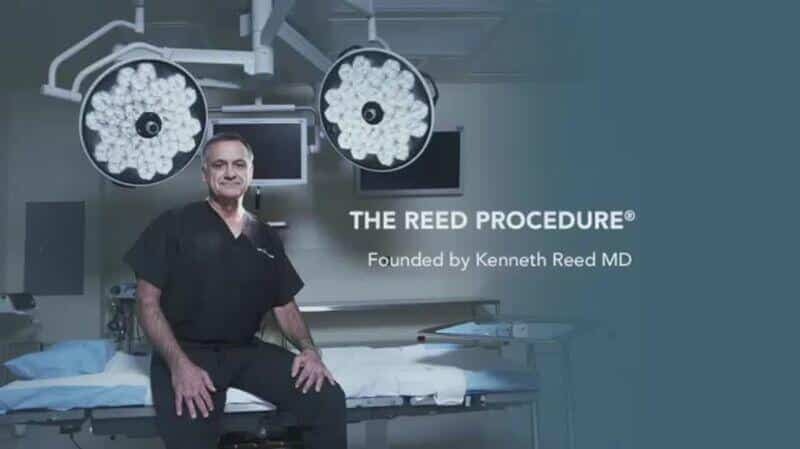 Dr. Reed explains how Reed Migraine invented the Reed Procedure for migraine treatment and are the world’s most experienced implanters. Dr. Reed explains peripheral nerve stimulator treatment for migraine treatment. Peripheral nerve stimulation is well documented treatment for migraine headaches. Dr. Reed details the nature of the Reed Procedure for migraine treatment. Dr. Reed explains the nature of the Reed Procedure for migraine treatment. Dr. Reed explains how occipital nerve stimulation provides migraine relief. Occipital nerve stimulation mode of migraine treatment is explained by Dr. Ken Reed. Who is a good candidate for the Omega Procedure and the Reed Procedure? Dr. Reed explains the criteria for determining candidacy for the Omega Procedure or the Reed Procedure. Dr. Reed explains the criteria for who is a candidate for the Omega Procedure and Reed Procedure migraine treatment implant. A trial occipital nerve stimulator procedure is explained. Dr. Kenneth Reed explains the trial procedure of occipital nerve stimulator. An occipital nerve stimulator trial implant is reviewed. The trial occipital nerve stimulator migraine therapy is reviewed. The occipital nerve stimulation permanent procedure is explained. A permanent occipital nerve stimulator implant is explained by Dr. Reed. Occipital nerve stimulation for headache treatment has an excellent safety record. The safety record of occipital nerve stimulation headache treatment is explained by Dr. Kenneth Reed. The cosmetics of implanted nerve stimulators is explained. Dr. Reed reviews considerations of cosmetics when evaluating an implanted nerve stimulator. Occipital nerve stimulation success restores patients to normal lives. Dr. Reed explains how occipital nerve stimulation may restore migraine patients back to normal lives. Reed Migraine has Patient Ambassadors available to discuss the Reed Procedure. Dr. Reed explains that patients who have already had their implants are available to other potential patients. There are numerous ways to obtain further information on the Reed Procedure. Dr. Reed explains some methods of obtaining further information on the Reed Procedure. A review of the Reed Procedure, including the trial stimulator, the permanent stimulator, and one patient’s story. Dr. Bulger demonstrates correct techniques in performing a trial peripheral nerve stimulator implant for migraine treatment. 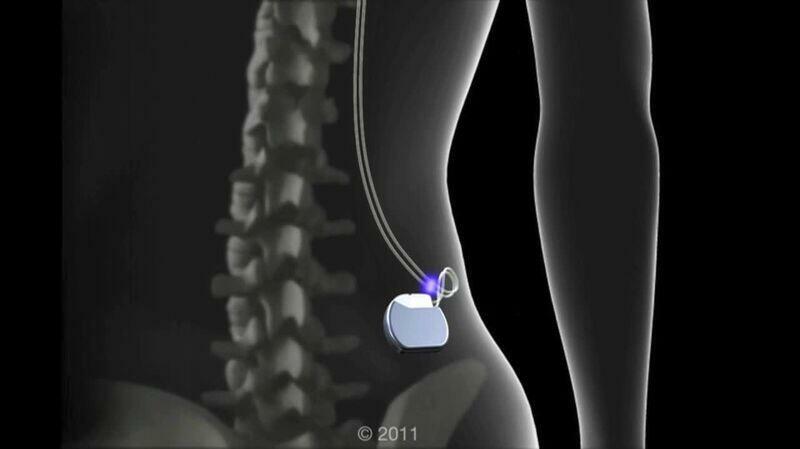 Schematic videos demonstrate where and how the implants work in the body. The schematic video available to view here shows only one place where the battery is implanted. The implant can also be placed in the chest where a pacemaker for the heart would normally be inserted. Video schematic of functioning occipital nerve stimulator. A video schematic provides an conceptual picture of how an occipital nerve stimulator works. 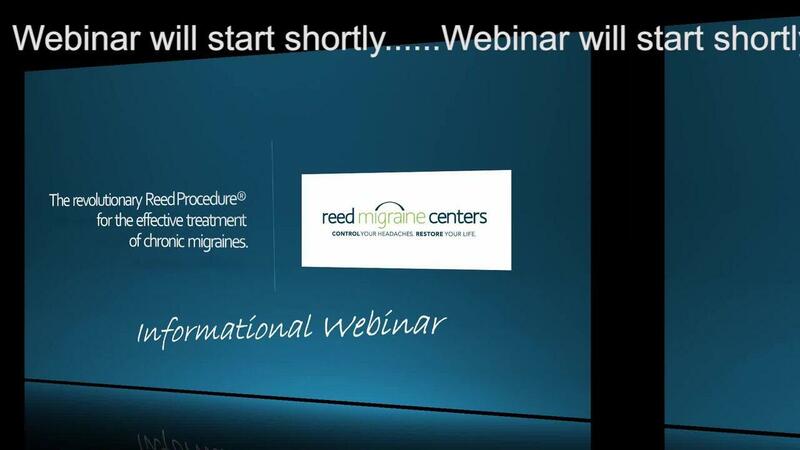 Free webinars are available on-demand for people or patients that want to learn more about Reed Migraine Centers’ Migraine treatment called the Reed Procedure. Learn if the Omega Procedure or the Reed Procedure is right for you. Below are miscellaneous videos about Reed Migraine Centers and the Reed Procedure. 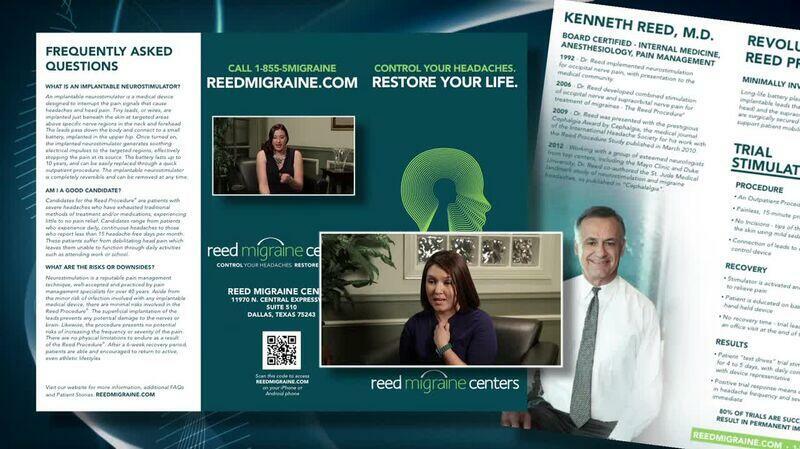 Reed Migraine Centers specialists are recognized world leaders in nerve stimulator migraine treatment. Introduction to Reed Migraine Centers phsycian specialists as recognized world leaders in nerve stimulation for migraine treatment. Reed Migraine Centers short introduction on its world leading specialists for migraine treatment nerve stimulator implants. Reed Migraine Centers short introduction describing why its specialists are world leaders for nerve stimulation for migraine therapy. Reed Procedure migraine treatment seminar is available. Advertisement of Patient Informational Seminar on Reed Procedure.